What I find most striking about these Palmer-Burgess adaptations has to do with their approach to language. This is a difficult & unwieldy subject, but I shall try to explain what I mean in the following paragraphs. The musical melodies are as it were constructed on the melody of the language itself, — the language being simply clothed in musical sounds; so that the fundamental rule for understanding Gregorian melody and singing it effectively is: — “Sing the words with notes, as you would speak them without notes.” The natural rhythm of spoken language is therefore the fundamental rule for the rendering of Plain Chant. The even measure (not equal measure) which is observed in a well-delivered speech—the natural melody of speech in undetermined tones—must in the practice of the Chant be transferred to fixed Tone-intervals. It often seems as if the ancient composers went out of their way to remind us that Gregorian chant has much more sophisticated ways of text-honoring than the “Baroque” method 2 of emphasizing the tonic accent. Fr. Haberl was a good person, and I’m sure he’s in Heaven, but he failed to recognize something fundamental: music is not speech. Music is music. Palestrina’s students couldn’t accept this fact, so they systematically mutilated 3 the entire Graduale Romanum, and eventually got their corrupt edition approved by Church authorities. Haberl’s spiritual descendants continue along similar lines today. For example, GIA Publications recently released a collection by a “sing as you speak” adherent, with a Preface saying the traditional method of intonation (wherein the cantor sings until the asterisk) is “not recommended,” because it allegedly shows a lack of sensitivity to the “spoken rendition.” But the author fails to realize the deep history behind such intonations, which stem from a time when pitch pipes were not available to give starting piches. Moreover, having the cantor(s) intone is more pleasing from an aesthetic point of view. THERE IS MUCH MORE that could be said about this subject. For example, it’s incorrect to speak of “the right way” to adapt Latin chants into English. The fact is, the Gregorian repertoire is vast, and various monasteries through the centuries had their own “dialects.” But why bring up this subject at all, when probably 95% of Catholic priests have no familiarity with Gregorian chant? So often, individual manuscripts (or even individual words!) are used to justify this or that approach. I’ve always felt that it’s necessary to take into consideration the entire Gregorian repertoire. I’ve often wondered what became of that project. I felt it had great promise, because it emphasized singing—that is, music as music. 1 The 1961 Solesmes Liber Usualis has something similar, but only for a few Tracts. 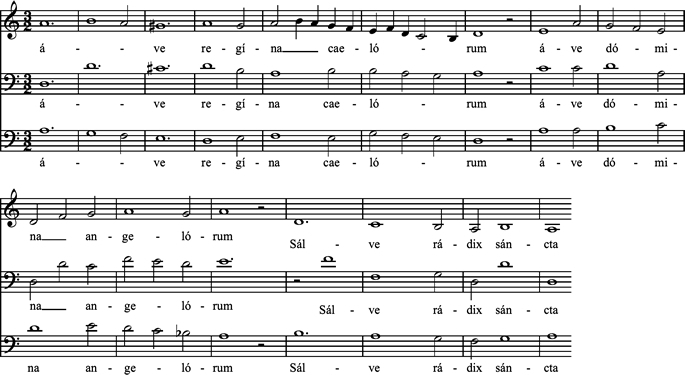 Examples of downright mis-accentuation are not rare even in fifteenth-century polyphonic music, a striking example being the passages angélorúm (correctly angelórum) and salvé radíx sanctá (instead of sálve rádix sáncta) in one of Dufay’s settings of “Ave Regina Celorum.” In cases like this, one cannot help feeling that the seemingly “bad” accentuation is actually a “good” one, dictated by the intention to counteract rather than over-emphasize. Whether the “barbaric” melismas in Gregorian chant result from such an intention or from plain indifference, it is impossible to say. 3 To learn more about this mutilation, click here. 4 All of them, that is, with the exception of three (3) which were created in the 1960s.